This Sotanghon with squid recipe is an easy and quick seafood soup dish to make on a lazy, rainy day. The sotanghon or cornstarch noodles are softened by soaking in water for a few minutes while the canned squid is being sauteed in garlic and onion. 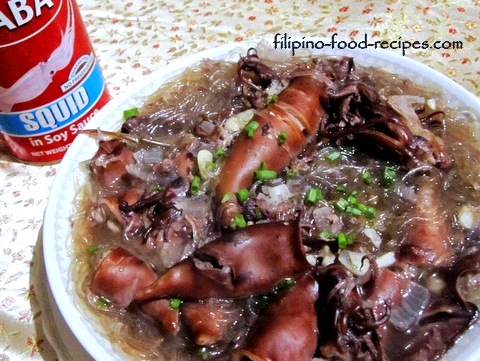 Adding vinegar makes it a little tart, so the taste is like Adobong Pusit meets sotanghon soup. 1 Soak the sotanghon noodles in water to soften. 2 Saute the garlic and onion, then add the squid. 3 Add the vinegar and bring to a boil, do not stir. 4 Put 3 cups of water and bring back to a boil. 5 Add the drained, softened sotanghon noodles.